No one wants to see a crack in a home's foundation. Any indication of weakness in the structure that holds up your house seems to be an extremely ominous portent, but if you see a crack, you shouldn't panic. A crack in a foundation wall, especially a vertical one, could be nothing serious and may not even require a repair. As concrete dries, it shrinks, and that shrinkage can produce cracks. The shrinkage can happen within minutes or hours after the concrete is poured due to excessive evaporation of moisture early in the drying process; these cracks are often diagonal and run across the surface of the concrete. Shrinkage that occurs more slowly may take weeks or months to appear; cracks that occur in this way are sometimes vertical and run from the top of the wall to the bottom. 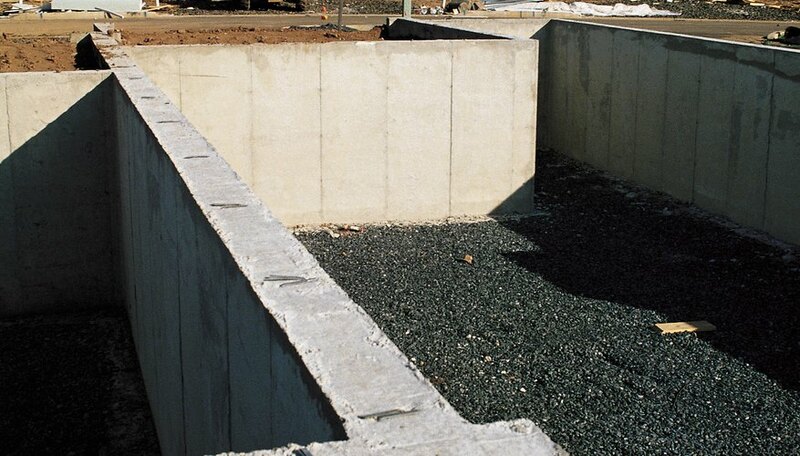 Settlement cracks occur when the soil that supports the concrete foundation compacts under the weight of the foundation, causing the foundation to move downward unevenly. Settlement can happen soon after the foundation is poured, or it can happen more slowly over time. Settlement cracks are often vertical, and they may be wider at the top than at the bottom because the foundation wall slumps downward on either side of the crack. Cracks may be caused by the lateral movement of soil against the foundation wall. The movement may be caused by factors such as the weight of water-saturated soil or vehicle traffic close to the foundation, and the crack happens when the foundation wall can't resist the pressure caused by the soil's movement. When the wall bows inward in the middle along a horizontal axis, a horizontal crack can result. If the pressure is higher up on the foundation wall, the wall is more likely to bow along a vertical axis, and a vertical crack results. Shrinkage cracks may be superficial, or they may continue all the way through the concrete slab; they rarely indicate structural weakness, although they may allow water to seep through the crack and enter the building. If settlement cracks don't get worse over time, the settlement may have stabilized, and the crack may not indicate potential structural failure. With these less serious cracks, a simple repair with a sealant product may be enough to solve the problem. Cracks caused by lateral movement are potentially more serious, and the source of the movement may need to be corrected to prevent further damage to the foundation. Popular Mechanics: How Worried Should You Be About Cracks in Your Foundation? What Causes a Crack in a Sidewalk? Can I Patch a Cracked Brick?